AppBuddy Cloud is an application for the mass creating, editing and deleting of multiple objects within one view. One parent object (such as Accounts) and up to four child objects (such as Contacts, Opportunities, etc.) can be exposed in each Grid. 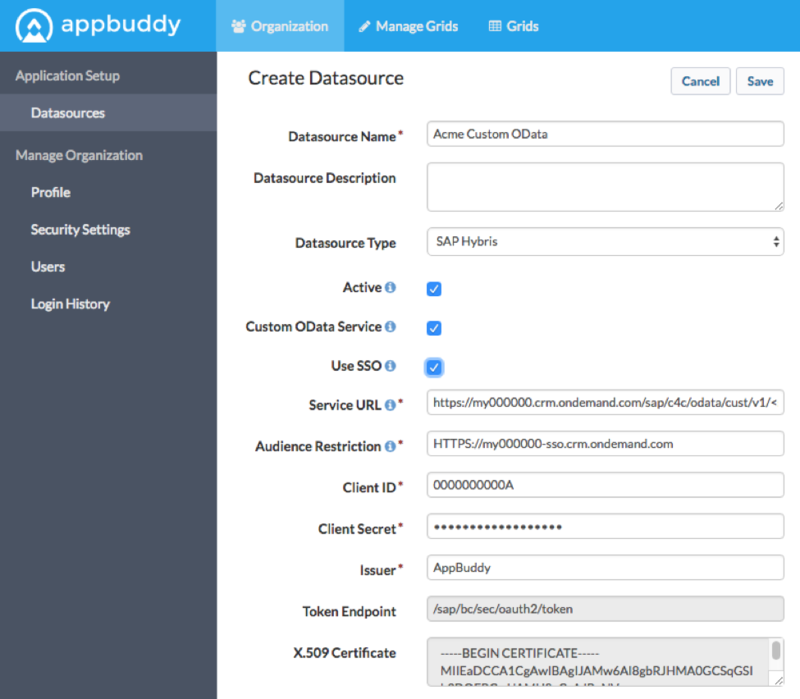 AppBuddy Cloud supports objects from multiple datasources including Salesforce and SAP Hybris C4C. Grids can be distributed by running from AppBuddy Cloud or embedded into a native application as an iframe. Create or update records using the “Edit”, “New / Edit”, and “Save” buttons. Large Grids will appear on several pages that can easily be navigated. Users can increase or decrease the number of records per page, expand and collapse views on an object or page level, and open record detail pages. Objects from datasources will maintain field level security, validation, permissions, workflows, and triggers are incorporated on a per user basis. A customer with a AppBuddy Cloud account. The Organization Admin has access to the Organization-level settings. See Modules for more detail. A user with any level of access in AppBuddy Cloud. See User Roles for more detail. A connection the Organization Admin configures on the Datasource screen that points to a live system. The configuration entails various details that will enable AppBuddy Cloud to establish a connection and authenticate users. Currently only cloud-based systems are supported through AppBuddy Cloud. The Organization Admin uses their own account credentials to setup the datasource, but other users will be prompted to specify their credentials in order to authenticate to the datasource. AppBuddy Cloud connects to systems as the running user, and not through a global / admin user unless the organization has an internal policy that allows them to use a shared login. Datasources are then accessible and referenced in several places in the application. They are required to exist in order for an admin to configure a grid, and for end-users to access grids. The end-user data management screen that most AppBuddy Cloud users will interact with. This interface queries the objects specified in the Grid definition (through the Grid Wizard) to present data that end-users can perform various actions and operations on. A 3-step wizard an admin uses to define the objects, filters, and display settings for a particular grid. AppBuddy Cloud uses meta data understand the objects and fields in your datasource and to display dependent and record type picklists, lookup filters, and lookup layouts on grids. There are 3 user roles within AppBuddy Cloud: Organization Admin, Grid Admin, or Grid User. A user may only be assigned to 1 role. Enables privileged users to manage Organization Settings, Datasource Connections, and Users within the organization. Organization Settings – includes name, description, active grids visibility option, and subscription details. Datasources – create, edit, test, delete connections to external systems such as Salesforce and SAP Hybris. Each datasource requires different information to establish a connection, these are displayed dynamically to the user once they choose a Datasource Type. 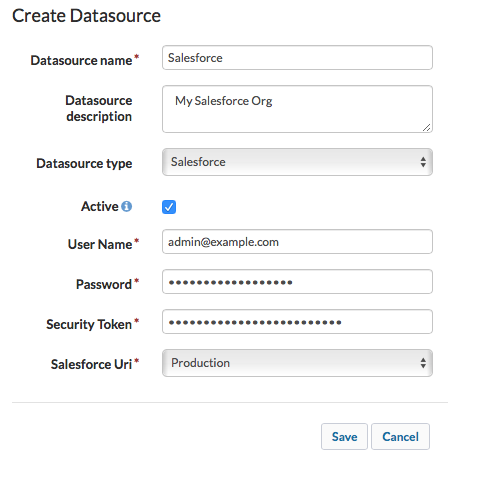 Use the Shared User option for Salesforce datasources in cases when all users should access the Datasource as a particular user instead of individual users. Users – create, edit, delete users who are part of the Org Admin’s organization who should have AppBuddy Cloud access. This includes setting the user’s role (see User Roles for access details). Groups – Assign groups of user to specific groups to control grid access. Enables privileged users to create and manage grid configurations (through the Grid Wizard), and grid-related functionality including Actions and Extensions. Grid Wizard – consists of 3 steps: 1. Choosing the parent/starting object from a particular datasource, 2. Choosing fields to display for the starting object and other objects, 3. Defining filters on the selected objects. Actions – create, edit, delete actions that can be launched on a single record, multiple records, or globally from the Grid. Actions can be associated to one or more grids through the Grid Wizard. Extensions – create, edit, delete reusable extensions that can be associated to grids. See Datasource under Terminology for datasource connectivity as it relates to individual users. When AppBuddy Cloud users request data from a datasource, AppBuddy Cloud will apply security rules that the datasource (underlying system) exposes including object-level, field-level, and record-level rules. 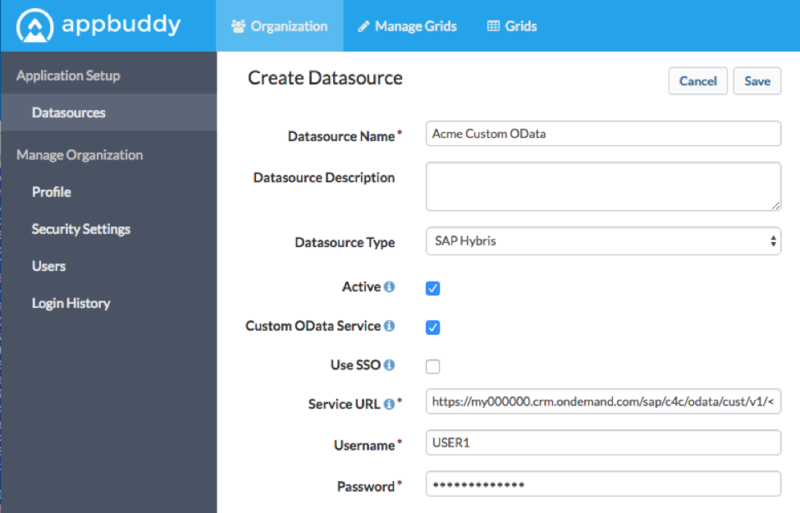 AppBuddy Cloud also offers ways to apply custom permissions per Grid in addition to the datasource’s permissions, including object-level, field-level and record-level. Custom permissions within AppBuddy Cloud will never give users more access than they have in the source system, custom permissions are additive. For SAP Hybris, you must set access rights for the users, in order to access grid data. Login to your SAP Hybris C4C instance. To do that, login to your SAP Hybris C4C instance, go to Administrator > Users > Business Users, click Edit > Access Rights. Go to Work Center and View Assignment tab. If the user needs to load grids of Accounts, assign them the CODACCOUNTWC work center. If the user needs to load grids of Opportunities, you will also need to assign them the COD_SALES_WCF work center. For admin users, assign them the SEODADMINWCF work center. 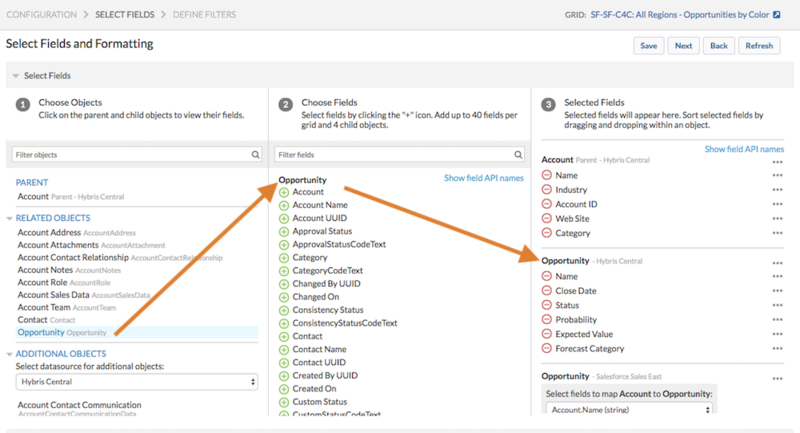 For Salesforce, you must enable API access, in order to access grid data. You must also have at least read access to some objects. Before enabling SSO for the AppBuddy Cloud organization, It’s recommended to keep one Org Admin user that is not SSO enabled. Enable the “Enable SSO” checkbox. Upload Identity Provider metadata by clicking “Select File” and then selecting a file. The AppBuddy Cloud Callback URL is: https://[subdomain].appbuddycloud.com/auth/sso/login/callback, where the subdomain will match the subdomain in the SSO URL. Set “SAML User Id Type”. If “User’s email as federation id” is selected, you’ll also need to specify the Business Email Domain. Copy the SSO URL from this screen, this is the URL you will use to login to your org with SSO. Go to “SSO URL” for your org and you will be taken to the SSO Login page. Click the Login with Single Sign On button and you should be taken to the login page for your Identity Provider. Enter the credentials and then you should be logged and redirected to AppBuddy Cloud. Groups enable admins to specify which users can access which grids. This is done by creating groups, assigning them to grids, and then assigning a group to users. Groups can be assigned to users of all role types, however groups are only applicable to users with the role of Grid User. Organization Admins and Grid Admins can access and manage all grids in the organization, irrespective of the group they belong to. Groups are an optional setting. When an organization has no groups defined then grid visibility is based on whether the grid is active or not. If an organization does have groups defined, but a grid is not associated to any groups, then Grid Users will not have access to the grid. Note – Please make sure in the organization settings “List Active Grids to Grid Users” is checked. To assign a user to a group you must be logged in as an Organization Administrator. Assign user to a group from the group dropdown. To assign groups to grids you must be logged in as an Organization Admin or Grid Admin. Assign groups to a grid in the “Grid Access” section. Set a “First Name” , “Last Name” , ” Email” , “Role” and “Group” for the user. Enable the “SSO Enabled” checkbox if you want to set up this user for SSO. Follow instructions in the popup to create a CSV file with the fields you want to create on the user. See sample CSV formats below. Limit the CSV file to 1,000 users. If SSO is enabled for an organization, there will be a checkbox in the Import Users popup, “Send welcome email to SSO-enabled users”. This checkbox will be checked by default. If you uncheck this checkbox, then SSO users that you import will not receive a welcome email. To deactivate a user you must be logged in as an Organization Administrator. To reactivate a user you must be logged in as an Organization Administrator. Observe the user status change to ‘Never Logged In’ for SSO users and ‘Pending’ for non-SSO users. Note: Upon reactivation, non-SSO users will have to set a new password to gain access to AppBuddy Cloud. Active: User is currently active on AppBuddy cloud. Pending: Non-SSO user account waiting for activation and first login by the user. Never Logged In: SSO user account waiting for the first login by the user. Locked Out: Non-SSO user locked out of the system after multiple retries with an incorrect password. Note: Users in the Inactive state are not counted towards the organization’s license limit (max users). Before a grid can be created you must connect a datasource. To add and connect datasource you need the datasources’s credentials. The datasource connection us used to get the datasource’s metadata is used by AppBuddy Cloud to understand the datasources objects, fields and related objects that make up your grids. To add a datasource, click on the “Organization” tab, click on “Datasources” and click “New”. You need to provide a Salesforce Account to connect. These credentials can be an API User or Salesforce user. The Account must have API Access enabled. Provide the account username, password, and security token as Salesforce. Pick the Salesforce Uri of Production or Test. After saving the metadata will be fetched. You should also test the connection. After testing the connection activte you datasource to be used in a grid. Note: Use “Production” Uri for Production and Dev salesforce Orgs and “Test” for sandboxes. 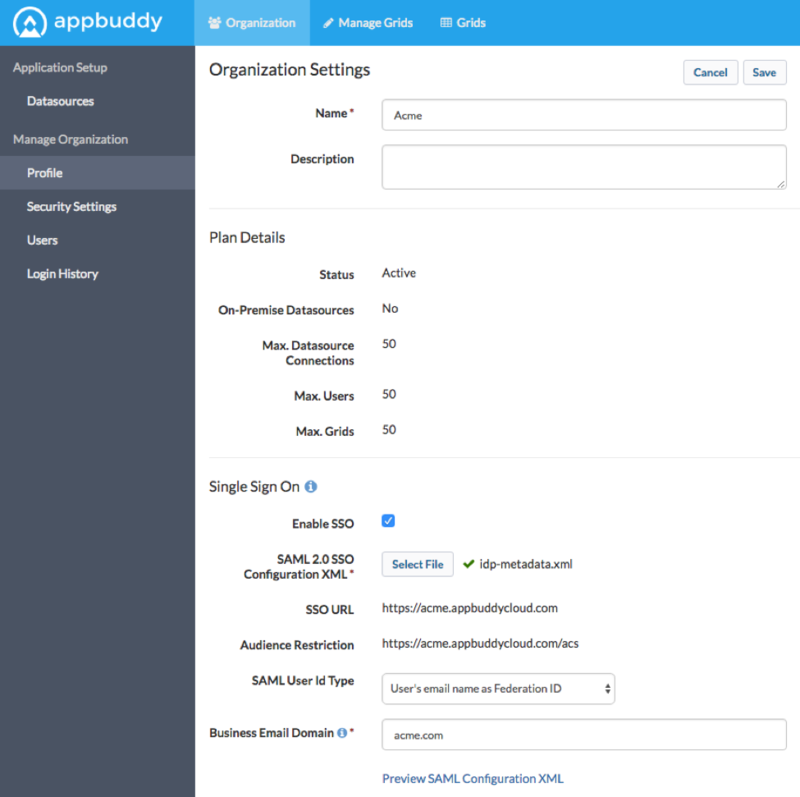 In order to configure SSO for a datasource, SSO must be enabled for the AppBuddy Cloud organization and your AppBuddy Cloud user must have SSO enabled. If SSO is not enabled for the AppBuddy Cloud organization, or your user is not SSO enabled, then the Use SSO checkbox will be disabled. When enabling SSO for your SAP Hybris datasource, you will have to set up SSO in SAP Hybris and will have to complete the OAuth 2.0 Client Registration there as well. Please review the Setting up SSO and OAuth 2.0 Client Registration in SAP Hybris section before proceeding with the SSO Datasource setup. From the “Datasource Type” dropdown, select the datasource “SAP Hybris”. Custom OData Services and SSO are currently only supported for SAP Hybris. Enter an “Audience Restriction”, “Client ID”, “Client Secret” and “Issuer”. The values will come up from the SAP Hybris system, after you set up the SSO in SAP Hybris and have complete the OAuth 2.0 Client Registration that as well. 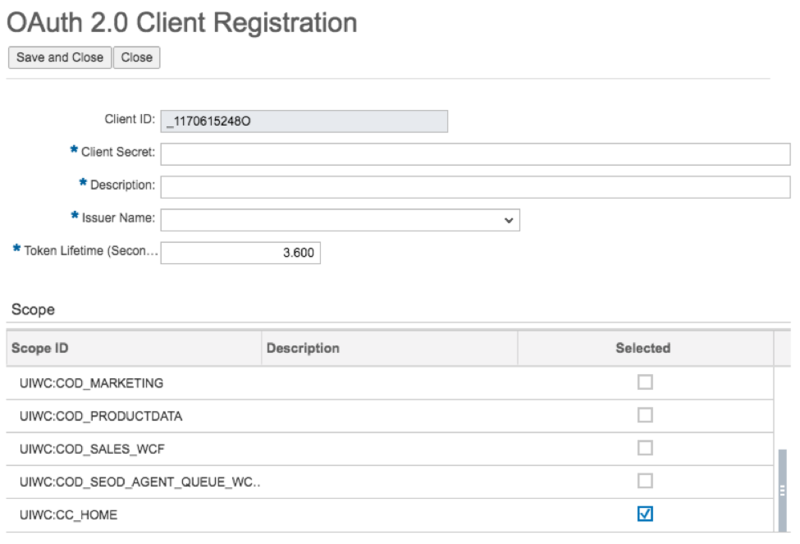 For “Audience Restrictions”, the value must match the “Local Service Provider” value located in the Single Sign-On settings for your SAP Hybris system. From the “Datasource Type” dropdown, select the datasource “SAP Hybris”. Custom OData Services are currently only supported for SAP Hybris. 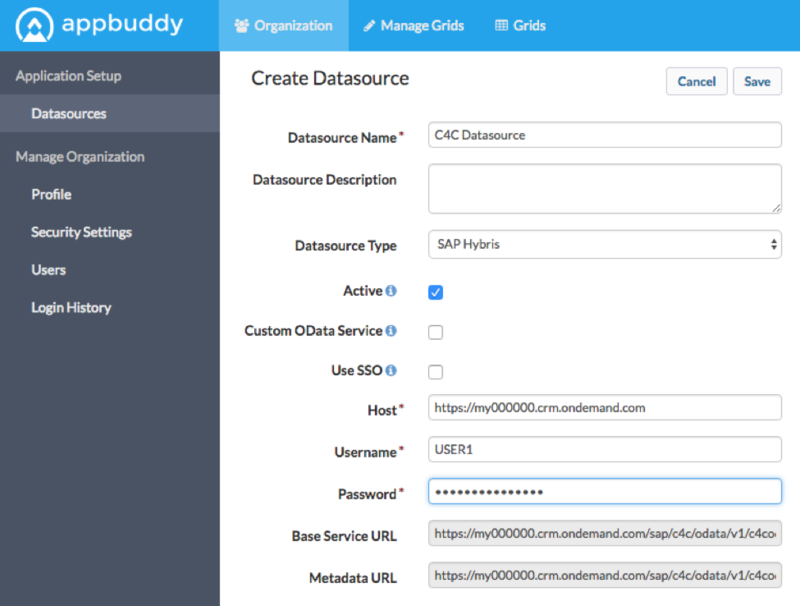 In order to configure SSO for a Custom OData Service, SSO must be enabled for the AppBuddy Cloud organization and your AppBuddy Cloud user must have SSO enabled. If SSO is not enabled for the AppBuddy Cloud organization, or your user is not SSO enabled, then the Use SSO checkbox will be disabled. When setting up SSO for SAP Hybris, you will have to set up SSO in SAP Hybris and will have to complete the OAuth 2.0 Client Registration there as well. Please review the Setting up SSO and OAuth 2.0 Client Registration in SAP Hybris section before proceeding with the SSO Datasource setup. Enter an “Audience Restriction”, “Client ID”, “Client Secret” and “Issuer”. Please see the Steps to create an SSO-enabled datasource section above for additional details regarding these fields. Also, if you have already set up an SSO datasource for a datasource that has a Custom OData Service, then you can reuse the same “Audience Restriction”, “Client ID”, “Client Secret” and “Issuer” values. In that case, the only thing different for the Custom OData Service will be the “Service URL”. Login to you SAP Hybris C4C instance. 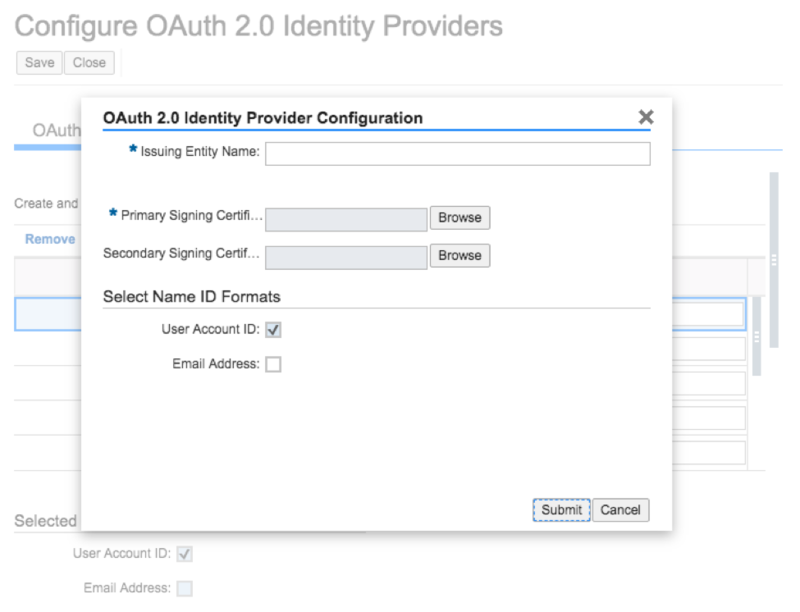 Select ADMINISTRATION, COMMON TASKS, then Configure OAuth2.0 Identity Provider. If the Configure OAuth 2.0 Identity Provider option is not visible, then please contact your SAP system administrator. 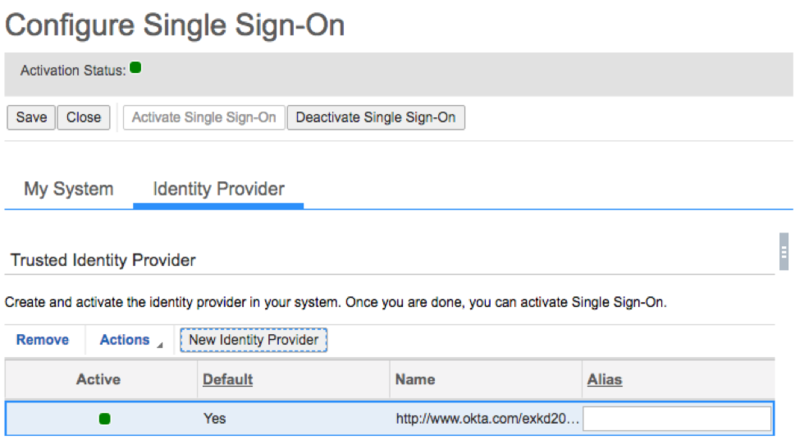 On the Configure OAuth 2.0 Identity Providers screen, click New OAuth 2.0 Provider. For the “Primary Signing Certificate”, select the .cer certificate file that you created from the value of the X.509 Certificate from the AppBuddy Cloud datasource screen. Open the OAUTH2.0 CLIENT REGISTRATION tab under ADMINISTRATOR and click on “New”. “Client ID” is automatically generated, save this value to use for setting up the AppBuddy Cloud datasource. Enter a value for “Client Secret”, save this value to use for setting up the AppBuddy Cloud datasource. Choose the previously defined OAuth 2.0 Identity provider for the “Issuer Name”. If the new Identity Provider doesn’t appear in the list, try logging out and logging back in, after which it should appear in the list. Configure your IdP accordingly and download the Metadata (see your IdPs documentation for this configuration). Login to your SAP Hybris C4C instance. 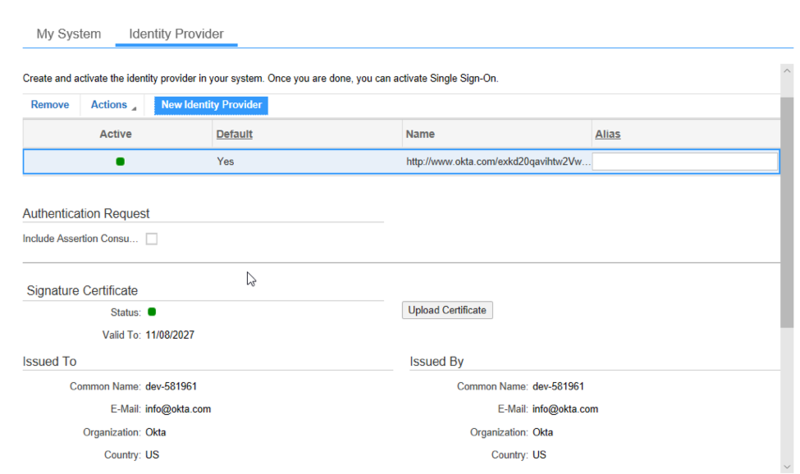 Select ADMINISTRATION, COMMON TASKS, then Configure Single Sign-On. Upload the Metadata from your IdP. All your IdPs data will be updated in this screen. The Grid Wizard enables users with the “Customize Application” and “View Setup and Configuration” Administrative permissions (set in the user Profile) to determine the objects, records and fields they wish to expose and/or edit within their Grid. The Manage Grids page is where you can create new or delete grids. You can also Manage Extensions and Manage Actions. Manage Grids: Use the picklist to create a new grid or configure an existing grid. Check the Enable Lightning styles checkbox to apply Lightning styles in AppBuddy Cloud.. Manage Extensions: Click the link to navigate to the Manage Extensions page where you can create, update and delete extensions for your grids. Manage Actions: Click the link to navigate to the Manage Actions page where you can create, update and delete actions. To deactivate/reactivate grids a user must be logged in as an Organization Admin or a Grid Admin. Note – If selected grids have different status (some of them are already inactive), only currently active grids will be deactivated. Once a grid is deactivated it will not appear under the “Grids” tab and will not be accessible to users with the Grid User role. Note – If selected grids have different status (some of them are already active), only currently inactive grids will be reactivated. Save Saves changes on the current page. Next Saves changes and takes you to the next page. Back Saves changes and takes you to the previous page. Refresh Refreshes the page without saving changes. Step 1 of the Grid Wizard lets you name a Grid, choose the Grid parent object, specify data management and display options. Note: changing the Parent Object of an existing grid will delete all the user-defined filter (see User-Defined Filtering) and column settings (see User-defined columns). Name Specify a name for the grid. Description The description of the grid. URL The direct link URL for the grid. Embedded URL The Embedded URL for the grid – used for embedding into iframes or Apps. Removes header formatting. Datasource for parent object The datasource for the parent object as setup under organization settings. Parent object The primary object for your Grid. Created by For existing grids, displays the name of the user who created this grid and the date it was created. Last modified by For existing grids, displays the name of the user who last modified this grid and the date it was modified. Edit Make this grid editable vs.read-only. Roll back on save Disallow partial saves on record fail. If one record fails, roll back all records to the last saved state. Mass update Enable mass update. User-defined filtering Users can define their own filter conditions. User-defined columns Users can define their own column order and/or hide columns. Specify display options that the grid will launch with by default. Records per page The number of parent records per page. Show related objects expanded – Related objects and their related records will be expanded. Show related objects collapsed – Related object sections will be displayed, but their related records will be collapsed. Hide related objects – Related objects will not be displayed, only parent records will be visible. In Step 2 of the Grid Wizard, you can specify the fields, conditional formatting and actions that should display on the grid. In the Select Fields section, the Choose an Object section shows you the parent object for the Grid and its related child objects. Newly created grids will automatically add the Name (or similar) field to your grid, which will be displayed in the Selected Fields section. Search for objects using the search box at the top of the Choose Object section. Click an object name to see its fields in the Choose Fields section. Search for fields using the search box at the top of the Choose Fields section. Select fields in the Choose Fields section by clicking the green “+” icon next to the field name. Added fields will appear in the Selected Fields section. Deselect fields by clicking the red “-” icon next to the field name in the Selected Fields section. Order fields by dragging them within the Selected Fields section. Click the Show field API names link to see API names next to the field labels. Click Hide field API names to hide the API names. Note:Removing a child object on an existing grid will delete all the user-defined filter(see User-Defined Filtering) and column settings (see User-defined columns). A section named Additional Objects in the Select Fields section – this lists all AppBuddy Cloud-compatible objects, based upon datasource, available, and they may or may not be related the parent object. Select the Datasource as configured in Organization->Datasources. This will show the list of available objects for that datasource. Grids can have multiple datasources related to the parent object. Map the objects to a common field. 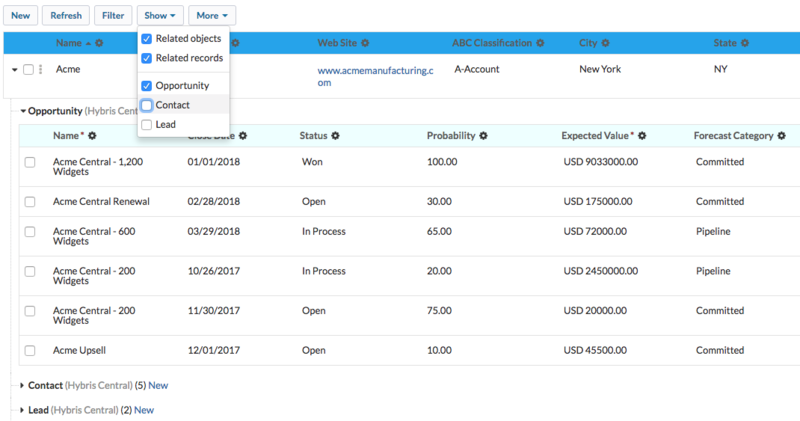 For example, setup a grid of Accounts and Opportunities, matching the Opportunity records from a 2nd datasource by the Account Name field to the Account’s Account Name field. The Account and Opportunity being from different datasource are not natively connected, but through Object Cross-Referencing users can work with them together. Page 2 of the Grid Wizard showing a grid additional objects from a 2nd datasource with Account as the parent object and Opportunity from the second datasource as a child. If a Opportunity has the same Account Name as the Account records Account Name will display as related to that Account on this grid. Choose the fields for the grid. A new section for that object will appear in the Selected Fields section along with a mapping widget, where you specify the fields that map the parent to this object. The mapped fields should be of similar data types. Or use a related object. For example, setup a grid of Accounts with the Opportunities object that is a related object. Page 2 of the Grid Wizard showing a grid with Account as the parent object and Opportunity as a children. If an Account has related Opportunity Members, either the Opportunities related to the Account will display as related to the Account on this grid. Choose a related object from the Related section in the first pane. You can customize settings for individual objects on the grid. To access these settings, click the ellipsis icon next to the object’s name. Label: Specify a label to show for this object on the grid. Plural Label: Specify a plural label to show for this object on the grid. Edit: Specify whether an object is editable or read-only. Create: Specify whether a user can create new records on this object. The Object properties widget open for the Opportunity object on page 2 of the Grid Wizard. Label: when a field is given a label, the label will be shown in grid headers and throughout the grid. Read-only: when a field is set to Read-only, users will not be able to edit this field. When a field is natively required in the object definition, it can be marked as Read-only. When a field is natively read-only in the object definition, the Required and Read-only options will be disabled. Required: when a field is set to Required, users will not be able to save new or existing records without filling out this field. Summary Type: for numeric fields, users can select a rollup summary type: SUM, MIN, MAX, AVG. Summaries can be applied to fields that have a numeric data type, as well as picklist and text fields that you know have numeric values. When enabled, summaries will display a summary row above the object’s data rows with the field values rolled up on the grid. Summary values are updated dynamically as you change the grid data. The summary only takes into account the data loaded on the page, not the entire dataset. Note – Currently we only support summaries on parent object. The Field Properties widget open for the Opportunity Name field on page 2 of the Grid Wizard.
) at the top center next to the object name to see what rules are applied to your grid (see screenshot below). Conditional formatting on the Grid. The formatting rules panel is open at the top center side of the grid next to the object name. Conditional Formatting rules are configured on page 2 of the Grid Wizard in the Conditional Formatting section. Format a field based on its value. For this, select the same field in both field dropdowns. Format a field based on another field’s value. To do this, select the field to evaluate in the first dropdown and the field to format in the second dropdown. Format an entire row based on a field’s value. To do this, check the “entire row” checkbox. Rule name: Give your rule a name that describes the rule. Evaluated field: We’ll evaluate this field’s value to see if we need to apply the formatting specified. Supported data types are: Boolean, Currency, Date, Date Time, Double, Formula, Integer, Percent, Picklist, String, and Textarea. Operator: Define a logical operator for the evaluation of the selected field. Value: We’ll evaluate against this value to determine to apply the rule or not. Formatted field: Optional, pick a field to apply the formatting to. The default is the evaluated field, but it can be any other field on the same object. Format entire row checkbox: Optional, select this to apply the formatting to the entire row. Background color: Optional, pick a color to apply as the background color. Text color: Optional, pick a color to apply as the text color. Text formatting: Optional, select one or more text formatting options. Conditional formatting rules on step 2 of the Grid Wizard. If the Opportunity Amount is greater than 1000 set the background color to green. If the Account Rating equals Hot, set the background color to red for the entire row. If the Task Due Date is less than a specific date, color the Task Name blue. In the Select Actions section, select one or more actions you want to enable on the grid. The actions displayed are associated to the objects you have selected and saved in the above Select Fields section. To define actions click the Manage Actions link or button. Use Step 3 to filter the data that is shown in your Grid and to order your Grid results. You can apply filter and ordering conditions to each object that you selected fields for in Step 2. Multiple filters can be saved in Step 3. Each filter that is saved will be available for selection by grid users. Saved Filters picklist on step 3 of the Grid Wizard displaying the default and saved filters. Each grid has a default filter that is created automatically. The default filter can be updated and cloned, but not deleted. The default filter will appear as “Default filter” in the My Filter picklist on the grid. Any other filters saved on Step 3 will appear with the “(Admin)” prefix in the My Filter picklist. Note, the filters saved on Step 3 will still show in the My Filter picklist on the grid even if User-Defined Filtering is not enabled for the grid. To create new, select “Create New Filter” from the “Saved filters” list. Make any changes and click “Save” to save your new filter. Note, filters cannot be named “Default” or “Default filter”. To clone, click the “Clone” button to clone the currently selected filter. The filter widget will reload and the name of the filter will be defaulted to “Copy of + [filter name]”. To edit a filter, select the filter from the “Saved filter” drop down, make any changes and save. To delete a filter, select the filter from the filter dropdown then click the “Delete” button. Note, the default filter cannot be deleted. Changing the grid’s parent object on page 1 of the Grid Wizard. Removing child objects on page 2 of the Grid Wizard. Specify whether the Grid will display all records or only the records the current user owns. Select up to 10 Filter by Field conditions. Enter a value in the input text box to indicate the filter condition. A blank value in the input text box denotes that the condition will evaluate for a null value. Below is a list of all available operators and a description of the conditions they check for. Some operators are not available for all field data types. equals Field value exactly matches criteria. not equal to Field value does not match criteria. starts with Field value starts with the characters entered in the criteria field. contains Field value contains any of the characters specified in any of the comma-separated values provided in the criteria field. Multiple comma-separated values are supported for SAP text, and ID field types. does not contain Field value does not contain any of the characters specified in the criteria field. less than Field value is less than the value of the criteria field. greater than Field value is greater than the value of the criteria field. less or equal Field value is less than or equal to the value of the criteria field. greater or equal Field value is greater than or equal to the value of the criteria field. includes Field value equals any of the comma-separated values specified in the criteria field. Multiple comma-separated values are supported for SAP numeric, text, and ID field types. excludes Field value excludes the value specified in the criteria field. For all text-based data types, the operators are not case sensitive. By default, filter conditions will be evaluated together with a boolean “AND” operator. For example, if three filter conditions are specified they will be evaluated as (1 AND 2 AND 3). See the Advanced Filter Conditions section below to specify other boolean conditions. Fields that are picklists, record types, or booleans will have their values accessible by clicking an arrow in the filter value input. You can also begin typing in the input to see matching values. AppBuddy supports the following relative date filters that apply to both Date and Date Time fields. Write conditions using “AND”, “OR” and “NOT”. If you specify an Advanced Filter Condition for an object, you must include numbers for all the Filter by Field conditions you added. When you add advanced filter logic, include each filter by field condition in the Boolean expression to avoid an error. Make sure all parentheses are closed. Enclose conditions that have priority in parentheses. For example, “(1 AND 2) OR 3” finds records that meet either both the first two filters or the third. While “1 AND (2 OR 3)” finds records that meet the first filter as well as either the second or third. If you specify filter logic, then add another filter by field condition, you must include that condition in your advanced filter logic. Likewise if you remove a filter by field condition, remove the corresponding number from the filter logic to avoid an input error. Begin a condition with the term NOT but do not end one with NOT. For example, “(NOT 1) AND (2 OR 3 OR 4)” finds records that meet any of the last three filters and excludes records that meet the first filter in Salesforce. Please note the condition will be different if using SAP Hybris C4C. For example, “NOT (1) AND (2 OR 3 OR 4)” finds records that meet any of the last three filters and excludes records that meet the first filter. This filter can help you find banking accounts owned by Joe or any account with a revenue greater than $10 million. 1 AND (2 OR 3) Finds records that match both the first filter line and either of the last two.Using the same filters in the example above, this grid finds all accounts Joe owns that are either in the banking industry or have a revenue greater than $10 million. You can also repeat a filter line in your expression. For example, the expression in this example yields the same results as (1 AND 2) OR (1 AND 3). (1 AND (2 OR 3)) OR 4 Finds records that match the last filter line as well as those that match the first and either the second or third filter line.For example, using the filter conditions in the first example above, if the last filter line is “Account Owner contains Susan”, then this grid finds all accounts Joe owns that are either in the banking industry or have a revenue greater than $10 million, or all the accounts that Susan owns. Select a field that the Grid object will be sorted by and whether it will be sorted in ascending or descending order. 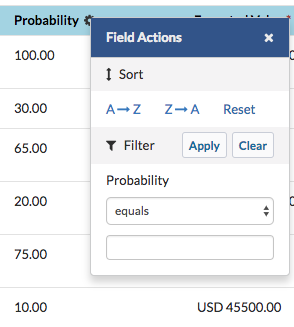 To sort by multiple fields, click the Add link at the bottom of this section, and select additional fields and their sort orders. You can specify up to 5 sort conditions. Each sort condition is applied in the numbered order you specify. For example, sort order condition 1 will be applied to your results before sort order condition 2, and so on. Note, if a user sorts by clicking on a gear icon on a column heading, it will override any sort conditions applied here. Set the maximum number of total records that will display for that object on the Grid. Note, this may be different from the number of records shown per page. See the Pagination section under Using Grids for more detail. Actions are processes that run against your data. They can also be links to records, for example, in Salesforce pages, AppBuddy Cloud grids, or external URLs or processes. AppBuddy Cloud actions are defined on the Manage Actions page, enabled on the Select Fields page of the Grid wizard and launched from the AppBuddy Cloud grid. Enter the Action Name, a free form field that labels the action. Choose the action Type. If the action applies to only one record at a time, choose the “Single Record” option. If the action applies to a set of records, choose “Batch”. If the action does not rely on any grid records, choose “Global”. 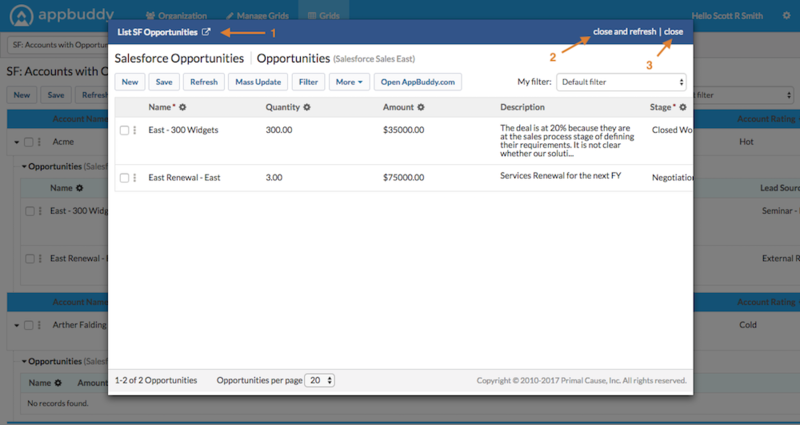 An example of a Global action would be a link to a Salesforce report. Choose Datasource. This is the datasource for the selected Object. Choose an Object, which can be an standard or supported custom object from the Datasource. Any grid that includes this object will have this action enabled for it on page 2 of the Grid Wizard. The Location field will be displayed if the action is type Batch or Global. Location has two options: Menu and Button. The Location configuration field lets you customize whether this action will appear on the grid under the “More” menu or as a button at the top of the page. Display Behavior indicates if the action should be launched in a new window/tab, a popup window overlay, the grid window, or displayed as a grid overlay. The URL that will be launched upon execution of the action. Should be an absolute URL starting with http or relative URL starting with /. Relative URLs can only link to grids within AppBuddy Cloud. Name of the ID Parameter to be persisted to the url. For example, you would input ‘recordId’ if you defined a ‘Single Record’ type action and the endpoint url expects a parameter named ‘recordId’. AppBuddy Cloud will persist ‘recordId=<id of the record where the action was launched>’ to the url. For most cases, this may simply be ‘id’. The Confirm Action option lets you enable a confirmation dialog before performing this action. If Confirm Action is enabled, the Confirmation Message field allows you to customize the message in the confirmation dialog. Now click the “Save” button to save your new action. You can also create and edit multiple actions at the same time, and then click Save once. Click the minus icon to the left of the new action name to remove it. You can delete existing actions by selecting the checkbox next to one or more action names and clicking the “Delete” button. When an action is deleted, it is also removed from the associated grids. Click on an extension name to see its details. In the Extension Details section, edit the Extension Name, Type, or Code Body. You can edit multiple extensions and save them all at once by clicking the Save button. Check the box next to an extension name and click the Delete button. You can select multiple extensions and delete them all at once by clicking the Delete button. Once a Grid has been configured, users can access it from the “Grids” tab or by using the embedded link. Embedded links are used to embed a grid in another page. For example in another web page as an iFrame, in a Salesforce Visualforce page, or in a SAP Hybris C4C mashup. Most methods of providing access to a Grid require you to generate a Grid URL. A simple version of the Grid URL is generated for you on page 1 of the Grid Wizard. Below are some URL parameters that the Grid supports. Including these parameters provides more control over how a Grid initially loads. ea “Expand All” option. A value of 1 shows all child related lists expanded by default. A value of show_related_objects shows all child related lists collapsed by default. A value of 0 hides all child related lists by default. Passing a list of object API names shows just those child related lists expanded by default, i.e. ea=Contact,Opportunity. This parameter only applies to multi-object grids. fpf “Filter by Parent Field” option. Specify the API name of a field on the grid parent object. Note, filter conditions defined in Grid Wizard 3 and in the user-defined filter widget will be applied in addition to the criteria specified by the fpf/fpv parameters. This parameter is only supported for fields with the following data types: id, lookup, text, picklist, email, URL, phone, boolean, date (literal (SAP only) and relative), and datetime (using relative dates). Additional “Filter by Parent Field” options. These can be added to grid URLs to filter grids further. “Filter by Parent Value” option. The value that the fpf parameter should evaluate to. Records that have this value for the fpf field will be displayed on the grid. Note, filter conditions defined in Grid Wizard 3 and in the user-defined filter widget will be applied in addition to the criteria specified by the fpf/fpv parameters. Additional “Filter by Parent Value” options. recordid Specify the ID of the parent record you want to filter child results by (see Detail Page Related Lists above). 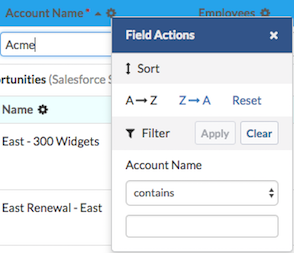 This ID must be a valid Salesforce record ID matching the object type of the parent object you defined in page 1 of the Grid Wizard. When this parameter is specified, the “ea” parameter is automatically set to 1 and the “sh” and “ssb” parameter are automatically set to 0, expanding all records, and hiding the header and sidebar. The URL above only loads a grid with records with an ID of 0015000000HtRNX. Based on the Grid configuration, the Grid may open by default in read-only or edit mode. If it’s in read-only mode and the configuration allows for editing, an “Edit” or “New / Edit” button will appear. The user will be able to edit fields based on their profile permissions. While the Grid is in edit mode, the buttons “Save” and “Read Only” will appear. The “Save & Return” option will appear in the More menu. “Save” saves your changes to the Grid data. “Save & Return” saves your changes and takes you back to the read-only Grid. “Read Only” takes you back to the read-only Grid. “Refresh” refreshes the Grid. Once you make changes to fields on the grid, the modified fields will show an orange background until it is saved successfully. Actions appear in three places on the grid: on the record level, in the More menu or as a button. Actions are crated from the Manage Grid->Manage Actions Page and enabled for each grid on the Grid Wizard Select Fields page. Actions that apply to individual records (e.g. Open Record) are can be accessed by clicking the ellipsis icon (1) next to each record on the left side of each row.The “Open Record” action (2) is displayed for every record by default. “Open Record” will open the record detail page in a new window. Single Record custom actions (3) associated to this object will appear below the standard AppBuddy Cloud actions. Clicking on the action will invoke it for the record you selected it from. 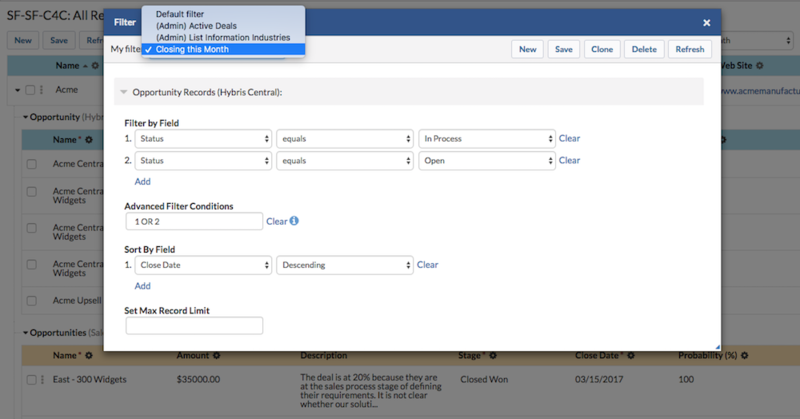 Grid overlay launched from an Account record to show a list of Opportunity records. The top bar of the grid overlay has a few useful links. Next to the action name (“List SF Opportunities” in the example above), there’s an icon (1) that will open the action in a new window. On the right, the “close & refresh” link (2) will close the overlay and refresh the grid. This is helpful when the data you’re working with in the overlay affects the data in the original grid. The “close” link (3) will simply close the overlay. More menu open on a grid showing standard and custom actions. Batch and Global actions can also be customized to display as buttons instead of menu items in the More menu. These buttons will appear at the top of the page next to the other grid buttons. The Show menu appears on multi-object Grids. This menu allows you to expand and collapse child object sections. Toggling the “Related objects” checkbox will show or hide the related object sections. Toggling the “Related records” checkbox will expand or collapse all related records. Toggle the object record checkboxes, e.g. “Opportunity” or “Contacts”, will expand or collapse related records of that object type across parent records. The settings in the Show menu can be configured on page 1, Configuration, of the Grid Wizard. See the Display section for more information. Show menu open on a Grid of Accounts, Opportunities, Contacts, and Leads. Leads and Contacts are collapsed. If the Grid contains child objects, child object records will be displayed under the parent object record. If child data does not exist for a particular parent record, the child object section will be displayed and the text, “No records found,” will be displayed. Show or hide all child objects for a particular parent record by clicking the arrow icon at the far left of the parent row. Expand or collapse a child object section by clicking the arrow icon next to the object name. Use the Show menu at the top of the page to show or hide all child object sections, or to expand or collapse child object sections. See the Show menu section for more information. If you have a grid configured with cross-referenced objects, there’s a possibility that one or more child records will match multiple parent records. In this case, AppBuddy Cloud will show the relevant records under each parent record, duplicating the child records where necessary. If duplicate child records are present, and the cross-referenced child object was setup using mapped fields on page 2 of the Grid Wizard, then AppBuddy Cloud will synchronize the changes you make across any child record that has duplicates. For example, if you have a grid where Contact is the parent, and Lead is the child, and multiple Lead records match multiple Contact parent records, then editing one Lead record will automatically show edits for the other duplicated Lead records, where those Lead records appear under other Contact parent records. “Create” was checked on the first page of the Grid Wizard. “Create” was not unchecked in the Object Properties popup for that object on the second page of the Grid Wizard. The user’s profile permissions allow for the creation of new records for that datasource’s object. If all the above conditions are satisfied, the New button will appear under the grid name in the grid header. Click this link for as many new rows as you want to create for that object. You will see new rows appear under the object header highlighted in orange. If you did not include all required fields for that object in the Grid, AppBuddy Cloud will append the remaining required fields to the end of the row so you can include values for them to save successfully. Enter the data for the new rows. If you include a value for at least one field in a new row, AppBuddy Cloud will not allow you to save the record unless you fill in all the required fields. If you leave all the fields in a new row blank, they will be ignored when you hit the Save button. If you want to exclude a new row you created from the Save operation, simply click the minus sign on the left side of the row. AppBuddy Cloud will do its best to pre-populate fields in new rows with default values if default values are defined. This includes fields with the following field types: checkbox, currency, date, date time, email, number, percent, phone, picklist, multi picklist, text, text area, text area (long), and URL. However, there are known Salesforce limitations that prevent AppBuddy Cloud from showing default values in all cases. Default values are not pre-populated for picklists that have “Restrict picklist to the values defined in the value set” checked. To create child rows under a parent record, first expand the child section for the parent record. A section will appear for all creatable child objects defined on the Grid. Each child object name in the child object section will have a New link next to it. Follow the instructions above to create new children with the New link. Note, you can also edit existing records on a Grid at the same time you create new records. If the “Enable mass updates” option is selected on page 1 of the Grid Wizard, the “Mass Update” button will appear on the grid. Click the “Mass Update” button to open the mass update widget which will enable you to specify a value for a field on any object on the Grid and apply that value to multiple records. Fill in the values for the fields you want to mass update in the widget. Once you click on a widget field, it will turn orange indicating that the field value will be used to mass update corresponding fields in the Grid (even if the widget field value is blank). Click the “Clear” link next to the field to clear the widget field value and specify the field will not be mass updated in the Grid. Apply to selected records by selecting one or more existing records on the Grid using the checkbox to the far left of row. You can select/deselect multiple records for a particular object by clicking the checkbox in the header row for that object or by holding the Shift key while clicking. Click the “Apply to Selected Records” button to apply the values to each selected row. Apply to all records by clicking on the “Apply to All Records” button. Only objects corresponding to widget fields you specified values for will be updated in the Grid. Finalize your changes by clicking the “Save” button on the Grid. After you are done creating new/editing existing records, hit the Save button to save and continue editing after save. If the save is successful, you will see a confirmation message when the page refreshes. Any save errors will show at the top of the screen with the grid in edit mode, and the records that caused the error will be highlighted in the grid unless otherwise noted in the error message. If your save was not successful, AppBuddy Cloud will display the edits you made, allowing you to update the error-related fields without having to remember and re-enter all your changes. If “Roll back on save” was selected for the object, no edited or newly created records will be saved if a save error occurs. Otherwise, AppBuddy Cloud will save all edited and newly created records that did not cause an error on save. If your save was successful and you do not see the records you created or edited appear on the Grid, ensure that the newly created or edited record falls within the filter criteria for that Grid or that it is not showing up on a different Grid page because it is being sorted according to the sort condition specified in page 3 of the Grid Wizard. When “Users can define their own filter conditions” option is selected on page 1, Configuration, of the Grid Wizard, this enables several filter options for grid users: the Filter Widget and Field Actions. Each of these filter options is described below. If the “Users can define their own filter conditions” option is selected on page 1, Configuration, of the Grid Wizard, the “Filter” button will appear on the grid. Click the “Filter” button to open the filter widget which will enable a user to specify alternative filter conditions for this grid. These filter conditions will only be applied for the user that specifies them, i.e., other users’ grids will not be affected by conditions specified in this widget. Please follow the instructions in the Step 3: Define Grid Filters section for how to specify the various options that appear in this widget. Save your changes by clicking the “Save” button on the filter widget. The filter definition will save, and the grid will automatically reload with the new definition. This definition will be persisted and applied for the current user until the user modifies it again. To create new, open the filter widget and select “Create New…” in the filter picklist at the top. The widget will be loaded with the default filter definition that was defined in page 3 of the Grid Wizard. Make any changes and click “Save” to save your new filter. Note, filters cannot be named “Default” or “(Default filter)”. To edit a filter, select the filter from the filter drop down, make any changes and save. To delete a filter, open the filter widget and select the filter from the filter picklist. Then click the “Delete” button. If all filters have been deleted, the grid will be loaded with the default filter definition that was configured on page 3 of the Grid Wizard. Selecting the (Default filter) option will load the default filter definition that was defined in page 3 of the Grid Wizard. Any option prefixed with “(Admin)” indicates a filter that was also defined in page 3 of the Grid Wizard. Use the field actions widget to freeze columns, filter, mass update, and sort grid data. Open the field actions widget by clicking the gear icon () in a field’s column header. When a grid first loads, the gear icons are opaque and inactive until the field actions widget has been initialized, after which they will become more prominent and active. User-defined filtering must be enabled on page 1 of the Grid Wizard for the filter section to appear in the field actions widget. Use the filter section to create, edit or remove field filters. When the widget is first opened, the operator will default to “equals” or “contains” depending of the field’s data type. Fields that have an existing filter will show the gear icon in green. Fields that are picklists, record types, or booleans will have their values accessible by clicking the drop box. Specify a filter value then click Apply. Clicking Apply will save the filter immediately and the grid will be refreshed with the new filter applied. Clicking the Clear button will remove the filter. Changes made using Fast Filters will overwrite any unsaved changes in the full User-Defined Filter widget. If a FastFilter is saved when the (Default filter) option is selected, the filter will be saved with the name “My + [grid name]”. If a filter named “My + [grid name]” already exists, it will be overwritten by the new Fast Filter. Similarly, if a FastFilter is saved when any option prefixed with “(Admin)” is selected, the filter will be saved with the name “My + [admin filter name]”. If a filter with this name already exists, it will be overwritten by the new Fast Filter. Click the links in the sort section of the field actions widget to sort your grid data. The sort section will not appear in the widget if a field is not sortable (e.g. Textareas and Multi Picklist are not sortable). Note, the sort condition applied here will be removed if a user specifies a filter condition using the Filter button. When the field is sorted – a arrow, situated between the field name and gear icon will show the short direction and the sort direction in the widget will be highlighted. Metadata panel open at the right side of the grid showing the grid’s conditional formatting rules and filters. The Reorder/Hide Columns link will appear in the More menu at the top of the Grid if this option was specified on the first page of the Grid Wizard. To reorder grid columns, click the link to open the widget and drag and drop the column names within the object section vertically. Uncheck the checkbox next to the column to hide it. Clicking the “Save” button will automatically refresh the grid with the new column display options. The column order and column hiding options will be saved and applied for the current user until the user modifies it again. These options will only be applied for the user that specified them, and other users’ grids will not be affected. If a user-defined column order is in place, the “Revert” button will be displayed. Click “Revert” to refresh the grid with the default column order defined on page 2 of the Grid Wizard. Select the number of records displayed on each page from the “Objects per page” drop down at the bottom of the grid in the sticky footer. Navigate among pages by using the pagination links at the bottom of the page, or the page number input. Navigating does not automatically save your data changes in “Edit” mode. Grid columns can be resized by hovering over the border of a column header, clicking, and dragging. The column width will be persisted between refreshes. Easily make configuration changes while working in a grid by clicking the “Edit Settings”, “Edit Fields”, or “Edit Admin Filters” links under the “More” button. These links will launch the Grid Wizard, and is available for users who have Grid Wizard access. In order for AppBuddy Cloud grids to show up correctly in Google Chrome, the “third-party cookies and site data” option must be enabled. Under Google Chrome settings, click Show Advanced Settings, and under Privacy, click on Content Settings. Make sure “Block third-party cookies and site data” is not checked. To embed a grid into SAP Hybris C4C, follow these steps. Click New button, and select HTML mashup. Add a name for the mashup. Select “URL” Type. Include a URL to your grid, i.e. https://www.appbuddycloud.com/grid/embed/8131B0DA-2B70-47BD-84A8-32F6BAC1A760. Set a height of 500. Select the Port Binding for the Work Center object where you will add your mashup. Go to Sales > Opportunities. Depending on the position of your cursor (see with the yellow highlight) click on the ‘+’ button and choose Mashup from the popup menu. You should see you mash-up listed (if you are in the correct layout). In the Properties section, check the Full Width checkbox. 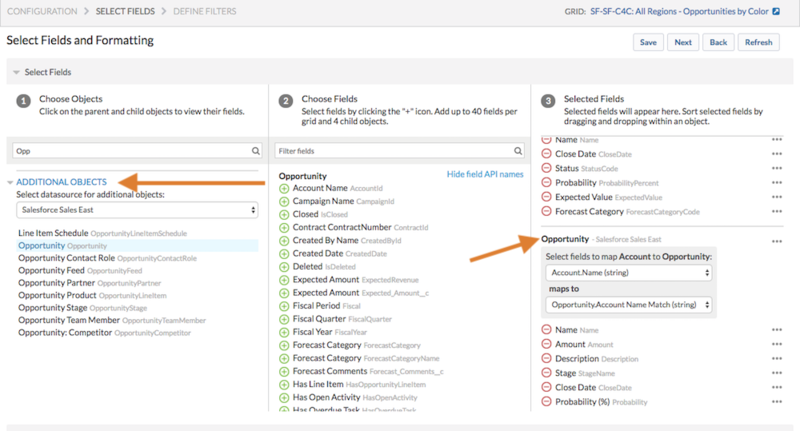 The AppBuddy Cloud grid inside a mashup should now be available on the Sales > Opportunities page. Have questions about how to do something in AppBuddy Cloud? Contact us!